This video from iFOODreal shows us just how easy making a delicious green smoothie can be! If you’re trying to detox after the holiday celebrations of weeks’ past, give this recipe a try. It’ll leave you vibrant and glowing. Thanks to iFOODreal for the amazing video and recipe! Add all ingredients to your Magic Bullet cup and blend until smooth. Add ingredients to your Magic Bullet cup and blend well. I used to hate carrot juice as a kid. Recently, I discovered this mango carrot smoothie, which doesn’t taste anything like carrot juice! It’s so good and good for you! I usually add yogurt or milk to my smoothies, but no dairy is needed for this one – just orange juice, water, banana, carrots, and frozen mango. This smoothie is packed with vitamin A and C, and will give you the nutritious energy you need to start your day. 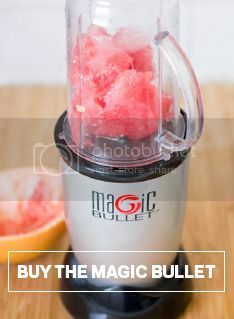 Add all ingredients to Magic Bullet blender cup and pulse until well blended. Can you smell the pumpkin in the air? This holiday smoothie makes for a nice, decadent dessert with all natural, whole ingredients and nutrients to boost! Enjoy it instead of that slice of sugar and fat-laden pumpkin pie and feel good about your holiday diet. I feel like Bubba from Forrest Gump, but instead of shrimps, I gots me some apples! We went apple-picking last weekend and we are still buried in a mound of apples. Made some apple pie and apple sauce and now we are on to apple cider smoothies! Pretty easy to make and just as good for you as eating two apples–without the chewing of course. Pour water into your Magic Bullet cup and add your cut up apples. Sprinkle the cinnamon over it and blend! It’ll be on the thicker side so you can add a little more water to reach your desired consistency. Put it in your favorite mug and enjoy a cool fall treat! I love smoothies. I drink them almost every day. Last weekend at the grocery store, I walked by some mint and impulsively bought it because it smelled so good, but I realized I had way too much of it once I got home. Instead of making my usual berry smoothie for lunch, I decided to experiment with mint and chocolate in a smoothie. Yes, the chocolate chips add on a few more calories, but in this smoothie, it’s worth it! It tastes like a mint chocolate chip milk shake! Just add a banana, ice, yogurt, milk, cocoa, chocolate chips and mint to a Magic Bullet cup and blend up this refreshing treat! Add all ingredients to a Magic Bullet cup and pulse several times until blended. Fall is just around the corner and what better way to welcome this lovely season into our lives that with a fall classic: Apple Pie. Delicious, warm, it really is the best. But baking can be time consuming and difficult, especially if you don’t have all the ingredients you need, all the utensils, or the time it takes to sit around and wait for it to bake. Chances are though, that you have a few common smoothie ingredients, some apples, and a few apple pie spices. Give it a blend in your Magic Bullet and get the season started with this tasty treat. In a nonstick skillet over medium heat, heat the butter or cooking spray and cook the diced apple, brown sugar and cinnamon until they are lightly browned and soft, about 4-5 minutes, stirring often. Add the mixture to your Magic Bullet once it’s cooled. Add vanilla yogurt, almond milk, nutmeg, allspice, and the remaining cinnamon to the Magic Bullet and blend until smooth! Enjoy chilled with a sprinkle of cinnamon for garnish. Have you ever tried a strawberry mango smoothie? If not, it is a definite must!! The combination of these two delicious fruits creates an even more delicious flavor. I could go for one of these any time of day, whether it is for breakfast or as a pick-me-up after a long day at work. Mangoes and strawberries are packed with fiber and antioxidants, and smoothies are an easy (and delicious!!) way to get in those extra fruit servings during the day. I get my frozen mango cubes at my local grocery store (Trader Joes), but if you can’t find them at yours you can easily slice up a mango into cubes and store them in a freezer bag until you are ready to use them. So now, I have 18 boxes of (mostly) Thin Mints. And I’ve eaten a lot, but I also stuck some in the freezer for the inevitable winter sans supplier. The other day I had a craving for some Thin Mint goodness, but wanted to mix it up a little, so I adapted this recipe from Shutterbean for a Milk and Cookie Smoothie. Ready for the next step? It’s real easy. Throw all said ingredients into your Magic Bullet. Pulse until it’s reached your desired consistency. I like mine thick and a little chunky, so I didn’t blend too long. Pop a cookie on the top–as an extra treat–and enjoy! Our favorite Edgy Veg Candice shows us her ultimate green smoothie recipe, along with some of her favorite smoothie-making dance moves. Blend in your Magic Bullet until smooth.